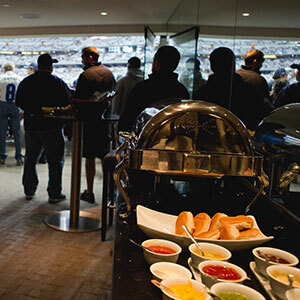 Comerica Park is beautifully designed with luxury suites and if you are planning a private event in one of these suites, catering is a detail that you cannot afford to overlook. 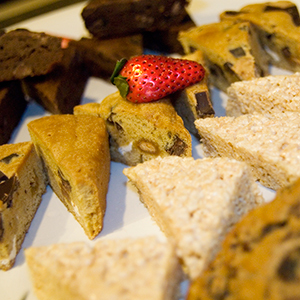 In-suite catering is what makes the suite experience truly special. Why would you invite guests to enjoy a Detroit Tigers game with you in a private suite and then ask them to leave the comforts of the suite to go stand in line for nachos? 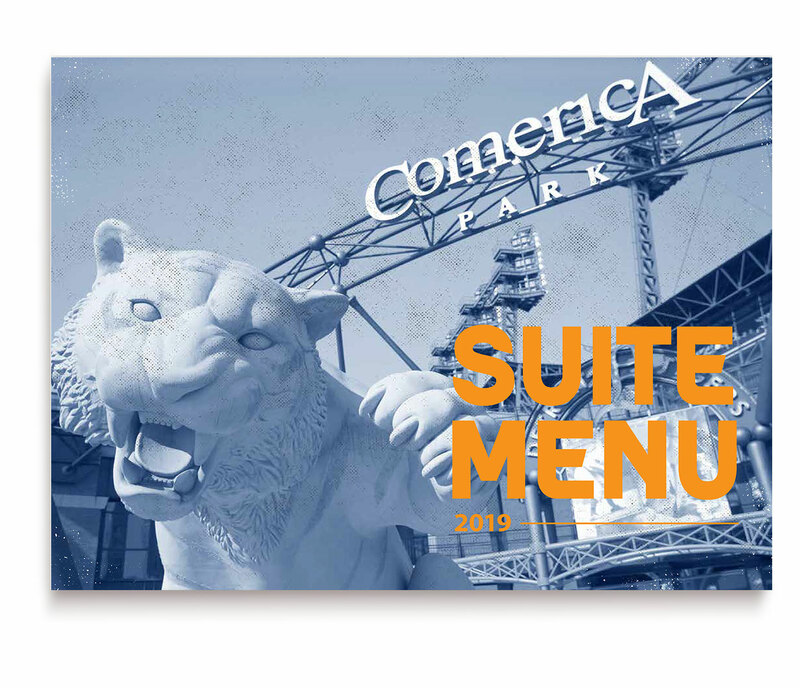 SuiteHop has seen it all when it comes to catering for suite events and we are here to ensure that you and your guests get what you want for your special time at Comerica Park. 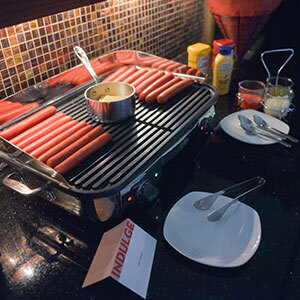 Whether you want classic ballpark fare or something unique and decadent served, the chefs inside Comerica Park know how to please a crowd. Choose from pre-designed menus that include snacks, a meal, desserts, and beverages or create your own menu from their a la carte selections. If you just want to serve snacks and drinks, that is an option as well. No matter what you choose, everything will be served fresh right in your private suite, making you and your guests feel like the VIPs that you are. 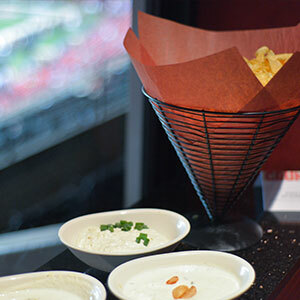 Trust SuiteHop to walk you through the process of ordering catering in your luxury suite. The catering guide for Comerica Park include helpful tips on how much to order based on group size and suggests the kinds of selections that work well in these settings. 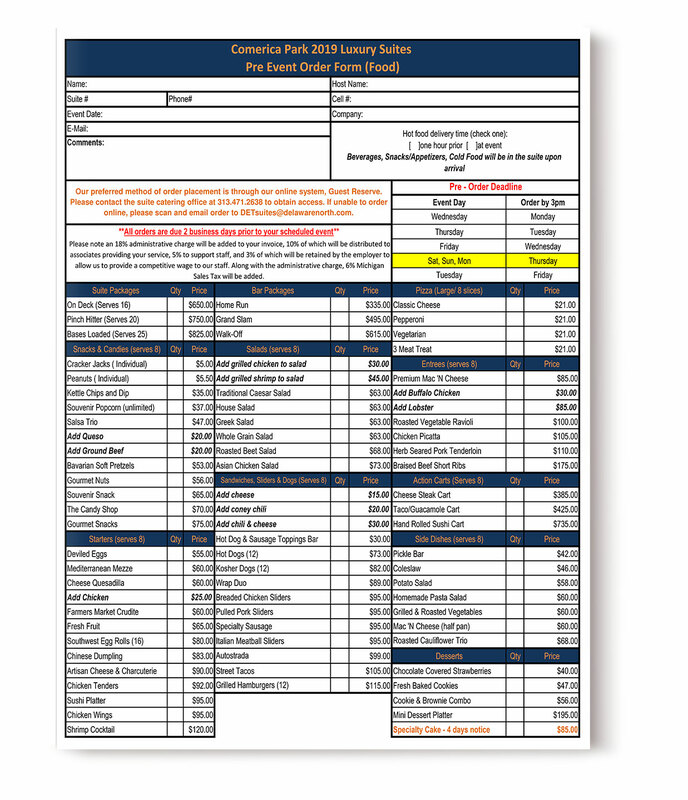 You can have us assist in turning in your order form. Once catering is all set, invite your guests and get ready to have the time of your lives in your private suite! Comerica Park catering is a complex and confusing process. To help extend your catering budget, we recommend selecting family style items (such as pulled pork) instead of individual portions (steak). 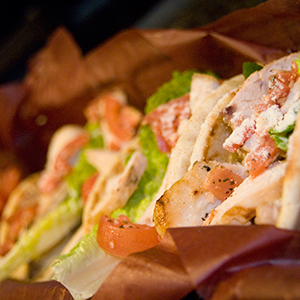 Most catering menus, including those at Comerica Park, require a minimum order of 6 portions. You do not have to order portion for every guest you are expecting to attend. This menu is based off the 2019 Comerica Park Suite Catering options. Items are subject to availability. Don’t be left in the dark about the complexities of a catering order and end up with a surprisingly expensive bill at the end of the evening. 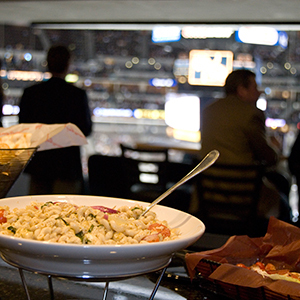 We’ve put together a list of our top Suite Catering Tips for Comerica Park.